Home � Disney World Discounts , Disney World News , Disney World Resort Hotels , Disney World Tickets � Spring 2015 Disney World Resort & Ticket Discount Offer! Spring 2015 Disney World Resort & Ticket Discount Offer! 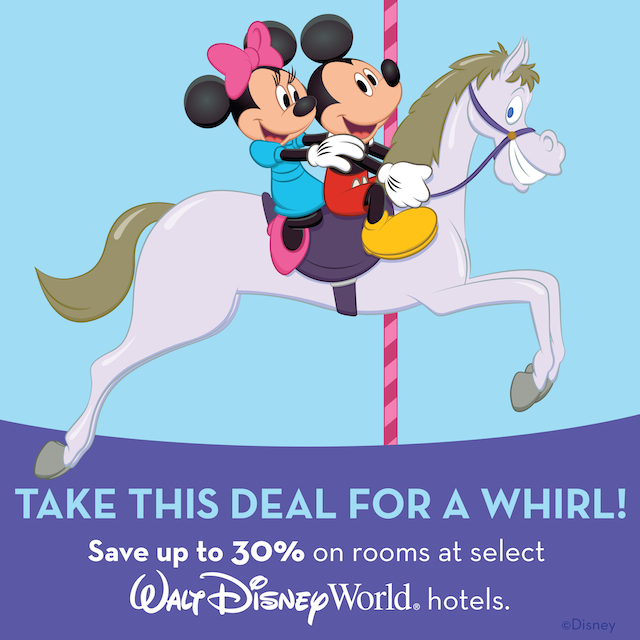 TAKE THIS DISNEY WORLD DEAL FOR A WHIRL! most nights Feb 22–Mar 1, 2015.
charges may apply if more than two adults per room at Disney Value, Moderate and Deluxe Resorts. Disney Deluxe and Deluxe Villa Resorts; lower savings may be available for other Resorts. package with a minimum 4-day ticket! 0 comments to "Spring 2015 Disney World Resort & Ticket Discount Offer!"